Discussion in 'iPad Help' started by Loxem, Jul 13, 2010. I have problem, like 1 day ago my internet in iPad is so slow even youtube cant load. My interne in PC is loading everything normal so i dont understand why its so slow on my iPad? you have to give us some more info other than the internet is going slow. have you rebooted your ipad? is your PC also using wifi? are you sure that your ipad is connecting to your wifi and not a neighbors? also you didnt even says if your using wifi, are you using your home wifi or 3G? Yes I rebooted my iPad few times. My PC is connected by cable to internet. The internet is not connected to any of my neighbors i connected to my own router. Well, for one thing the you computer being connected via cable is going to be much faster than anything connected to wifi. Go to the app store on you iPad and download a speed test app. Test the speeds your getting on the ipad. 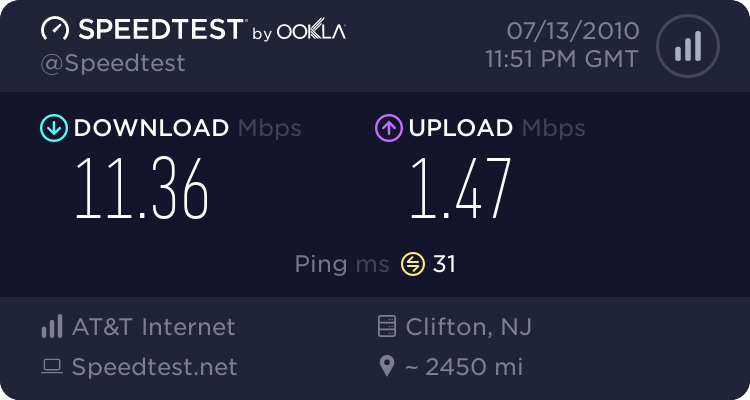 Then go to speedtest.net on your computer and see what speeds your getting on the computer. Come back here and let us know what speeds your getting on the PC vs iPad. Example: my computer connected via cable showed it was getting about 20mbps while my ipad on wifi is getting 11mpbs. Your ipad is getting the speeds that it should from what your test show. youtube goes slow all the time especially when they get overloaded with people watching videos. It doesnt matter how fast your internet is if the place your going is sending you stuff slower than your connection speed. It doesnt matter how fast your internet is if the play your going is sending you stuff slower than your connection speed. But try this. A lot of times, the YouTube app is slow. Try viewing the same video on the YouTube website using Safari. For me, a lot of times YouTube is faster via Safari.